This is an ongoing project, which has been continually evolving since 1998. 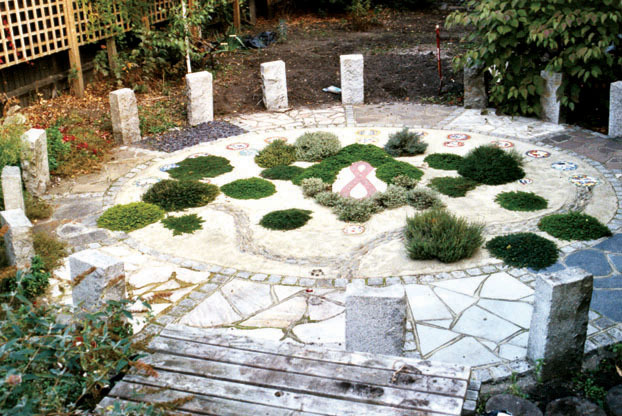 It started with the production of a fundraising brochure outlining plans for the garden. This enabled the school to apply for funding for the different elements of the project. The first phase was the creation of a Woodland Garden in the far end of the Secret Garden. It included the planting of a "1000 Year Old Hedgerow" with eleven different species of hedgerow plant over a length of 12 metres; the sowing of a wildflower meadow / woodland glade; and the installation of log seating for an informal outdoor teaching area. The pupils took an active part in the work, helping with the preparation of the planting ditch for the hedgerow, the planting itself and the sowing of the wildflower meadow. Exhibition panels to document the project and give background information were prepared afterwards and displayed in the school. The second phase is now also completed and involved the creation of a 'Human Sundial' with a geological pavement and 'Four Seasons' planting beds on each corner.